The Landscape industry is notorious for its cowboy element and you might see a rogue trader on the BBC at any time rooking the unsuspecting, who have not done their homework. Some of the criteria to finding the right person are obvious, others are not so. Here are some points to consider before parting with your hard earned cash. Seek estimates or quotes from well established and reputable companies or individuals. There are literally thousands of contractors in the UK, from part time one man bands to small firms operating a handful of staff. This can make the procedure a little trickier as you have to become detective if you want to establish what they have done in the past or more importantly what they might have done wrong. If you see a contractors vehicle passing regularly through your area and they a clean and tidy vehicle then make a note of the number. The condition of their equipment and vehicles can be a tell tale sign of their aspirations for your new garden. Once you are confident that they are not five minute wonders and you have established that they have a good reputation then give them a call. Ask friends or family if they have used anyone in particular and if the contractor has done a good job. Word of mouth is a naturally good way to pass on good operators. Avoid cold callers to the door like the plague. If they come to you and especially if they give you a card with no address and just a mobile number then your on a loser instantly. Cold callers can be very intimidating and understandably some people, often the old, fall victim to their charm or aggressive style and more often than not they leave very shoddy workmanship. Once you have established a likely source for your reputable contractor(s) then invite them round for a briefing. This in most cases should be informal and most definitely free (unless you are specifically asking for advice that you might agree is worth of a charge). A good rule of thumb is get three quotes/estimates. Remember, a quote is binding by law but an estimate is just a guide and if you are not careful the final bill may rise with extras that are not foreseen. Read terms and conditions in conjunction with estimates. For example I always say that the price for any excavations was to a depth of 1 metre. That is a reasonable depth because the contractor does not want to be liable for expensive corrective measures should he find something untoward. I estimated to remove a large Rockery near Farnham. Under that Rockery was a large mound and I said to the client that I would estimate the price based on the mound being soil, I joked that I didn't want to be caught for any extra costs should I find an air raid shelter underneath. You guessed it, it was exactly that and the concrete was so thick we had to leave it as the cost to remove it was too prohibitive for the client. In the end the top became a base for a new raised terrace. Ask as many questions as you can and it is really worth typing out your specification with a sketch or a scaled drawing done by a garden designer to accompany your specs. If your contractor knows his business he should be challenging as much of your design as possible. If you require a patio with retaining wall for example, he should be asking you if there are any services i.e. electricity, water, gas or drainage pipes running in the area of the proposed excavations. They should ask the route, the depth and so on and you will normally find that if they have prepared terms and conditions there will be reference to services. A sensibly contractor will disclaim damage to underground services unless they are made aware of their exact location in advance. Some will do a CAT scan to locate if there is uncertainty but normally you will be responsible unless the contractor is negligent and you can show this, should there be a problem. Establish the exact specification for the sub bases and footings. You may well express a desire for the sub bases to be a certain depth. Perhaps it is a cost consideration or just inexperience. 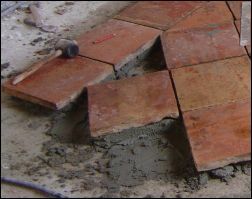 A good contractor should be able to advise the depth of footing concrete for example based on instinct. Remember, if you specify something wrong and it is carried out to your instructions then you retain responsibility. Also worth bearing in mind is your contractor should be worldly wise and whilst your plan or drawing may look good, does it actually work? Check dimensions and heights with him because your eye may tell you you need one step up onto the lawn but the tape measure never lies and it may well be three. This leads onto practicalities in getting equipment up onto the top lawn in the future. A bad back often occurs when you have to lift your bulky mower up and down steps every Saturday. Take the access into consideration. The price of any work can dramatically rise if the contractor has to wheel several tonnes of materials along a side passage. Estimate how long it takes to load a wheel barrow and wheel it to the back garden. A five minute round trip doesn't sound long but when you get fifty wheel barrows just to get the sand or soil round to where it is needed you have used half a day. Once the contractor has taken your brief, advised you if he feels there may be shortfalls and verbally corrected them, he will go away and prepare a quotation or an estimate. A good contractor will re-write a specification based on your initial brief. This serves two purposes. To protect him when the work is being executed as lack of written and agreed specifications leads to ill feeling or worse legal disputes should there be a disagreement. It also means he doesn't have to do more than the specification. Lack of agreement on what both parties thought was being provided in the price can make a great deal of difference to the profit margins but also it means the contractor cannot skimp. If the contractor returns the paperwork within a week then they are keen. If it takes 2-6 weeks and they need chasing then it is a tell tale of how they work. You do not want a contractor taking more time than is estimated and you certainly don’t want him to leave you in the lurch whilst he does another job at the same time as yours. I just gave a landscaping contractor a check for 21,500 dollars as 50%down payment for a significant job around my backyard and pool area. He did beautiful work for my own mother but now he is not showing up at my house. its been 4 weeks and I have one retainer wall removed and nothing else done. He says whatever you want to hear when you complain but he is a no show. what course of action can I take. I am sorry to hear about your predicament. This is a difficult situation to be in and needs to be handled with care at this stage. Looking at this from a contractors point of view the work should have been continuous after start unless there had been an agreed time scale otherwise from the off. Are there any agreed terms and conditions for the project and did the contractor give you an idea of how the job was to be tackled? Have you heard from any other source if the contractor is any kind of financial trouble? I am not a legal expert and can only talk from experience but I think you should write a letter in the first instance detailing everything you think you agreed and ask specifically what the reason for the no show is. If you do not receive a favourable response I sense that legal action may be required. It is not the best of situations to be in but damage limitation should be your initial aim. Hopefully, your contractor is experiencing a blip in procedure. Maybe he has taken on too much and is trying to keep more than one client happy at the same time. Nice article. As a landscape designer I would like to add that hiring good contractors can be a bit of of a challenge specially when there are literally hundreds of landscaping companies to choose from. One way of finding the right one is to look around your neighborhood and ask the name of the contractor who did a splendid job in their property. This allows you to see first hand the quality of work rendered. Also, a good contractor will walk you through the process of the project. How long will it take, will your idea work out, is it possible or not. Is it doable or not, will it be more expensive that you originally planned. They would advice you of what is more practical in achieving the same goals. In short, a good contractor will work together with you and not just do what he pleases. I agree the importance of selecting a good contractor to carry out your landscaping works and would strongly agree selecting a firm registered with BALI or APL. I sorry to hear the problems that Carolyn Ryan are facing. With an APL member you have a customer charter that all complaints are dealt with. With APL members they are trustmark accredited which give you a warrenty for the works which covers you for your deposit and works for a total of 6 years, so say if the company took a deposit off you and went bust the trustmark will cover you and will either give you your money back or arrange for another APL member to carry out the works for the price quoted. I think a no brainer!! I am a Landscaper and a registered member of the APL and have found clients are a lot more at ease with the works as they know that we have been vetted and on site inspected and know that we are not 'cowboys' but are fully qualified knowledgable landscapers. I hope this has given a bit of reassurance for people in selecting a professional landscaper. I recommend researching some of the best know landscape designers in their field. they can then do the design and recommend a quality firm to carry out the work too. I was in a similar position to you a couple months ago and I found a company called Dreaming Green, I found them by typing gardener in London on Google. After I had a polite chat with them I found out that they actually helped out on an episode of cowboy builders (they were the good guys) and they pulled off a terrific job and at an affordable price. i had faced a similar situation where i thought it is Garden contractor and it turned out to be someone else. It's interesting how you suggest that the condition of a landscapers equipment and vehicle can be a tell tale sign of their aspirations. I have a few landscaping projects that require the knowledge and skills of a professional, so I thinking I will hire a landscape contractor. I never thought to look at their vehicle or equipment, but I like the idea of a contractor who uses equipment that isn't rusty and old. I think it is really great how you mention getting quotes or estimates from reputable before the job starts. I never knew that a quote was binding by law but an estimate wasn't. My husband and I are looking for a landscape contractor for our desert of a back yard. This was really helpful since neither of us have hired a contractor before. Thanks for the advice, I will keep it in mind to specify a quote before the project.